The Hubbell ER explosion resistant water heater is the right choice for applications in hazardous atmosphere locations. All operating controls are housed within the heavy duty explosion resistant enclosure to ensure safe operation in a hazardous location. 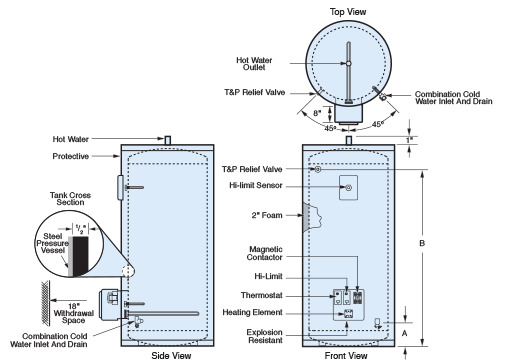 The Hubbell ER explosion resistant water heater is the right choice for applications in hazardous atmosphere locations. All operating controls are housed within the heavy duty explosion resistant enclosure to ensure safe operation in a hazardous location. 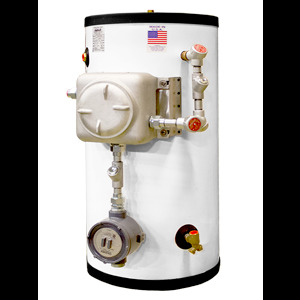 Furthermore, because of the exceptional corrosion resistant properties of the Hubbell Hydrastone cement lined tank, the ER model water heater is proven to last longer than other conventional tank designs. When you specify and install a Hubbell Model ER for a hazardous location you will have confidence in knowing that the owner will be provided with a quality product that is a safe, long lasting and trouble-free source for hot water. Note: For alternative voltages, KW sizes and/or storage capacities above 119 gallons, please contact us directly.